Please put your seal stories in writing! Magazine LOODUSESÕBER collects tales about the Animal of the Year until Christmas. 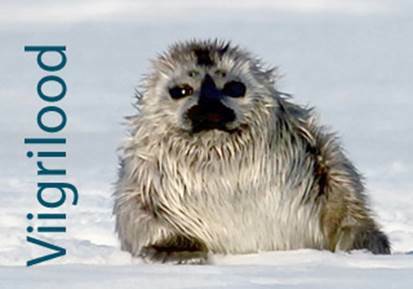 We invite your true stories about ringed seals and gray seals because those two bewhiskered creatures are easily confused from a distance. Send us stories about encounters with them, or tales heard from your grandparents, stories about coming across tracks of their activities, seal rocks or seals in fishing nets. At the end of the year awards are waiting for the best writers. Most of the stories will be published in magazine Loodusesõber or in Looduskalender. From my childhood I remember once when I was at the beach a large seal lying between the stones on the beach, a real treat for the gulls. I have seen dead seals on the shore a few more times, and found seal bones too. A rocky shallow quite close to the shore is called Hülgerahu, ”Seal repose”. As a child I always wondered if there were many seals together there and were they there peacefully? And why do I never see them? But sometimes, if you happen to be just at the right moment in just the right place you can see them, and those rare encounters are splendid.